The 'Provisional Government' of Israel which was the governing body until the first elections included members who came mostly from socialist parties. The leading party was Israel Land Workers Party (MAPAI) which after some unifications and distributions is today's Israel Labour Party which was in power in 1948-1977 and 1992-1996. The Freedom Movement (Kherut) which also after some unifications is today's Likud Party was a rival fraction in 1948 and therefore had no part in the 'Provisional Government'. The flags used during the 1999 political campaign lacked any vexillological value, in my humble opinion. All parties used flags which were usually the name of the party or a slogan on a bedsheet. There were so many variants to each party, you cannot even speak about semi-official flags. Major parties used combinations of blue-azure-white. Some parties used green on white or red and white. The only party that showed something that can be considered as a semi-official flag was Meretz. In the flag of Ale-Yarok (Green Leaf) party, the famous green leaf replaced the Magen David on the Israeli flag. Both the Likud party, the Labour party and the Moledet flags all show their logo [instead of the Magen David] on the national flag which is a common practice in Israel since many municipalities follow this pattern too. National Arab Party (Mifleget Aravit Leumit): 2 seats, departed from the United Arab List, one of them member of the Islamic Movement. United Arab List (Reshima Aravit Meukhedet): 3 seats, after the depart of two members, all remaining members are from MADA (Mifleget Democratit Aravit / Hezb al-Democraty al-Arabi, Arab Democratic Party); Dahamshe is one of the members. TA'AL (Tnua'a Aravit le'Hitkadshut, Arab Movement for Renewal): 1 seat, departed from BALAD. desire. Those letters usually don't reflect the real name of the party. Herut and lamed of the Liberals). When "Shas" was established the asked and got the letters shin-sameh, and as become with other parties (such as MERETZ), the party is more known by its letters then by its official name. Each party got its own "letter" or combination of letters which sometimes became a second "nickname" for the party or sometimes its publicly known name. Those letters are not alaways connected with the party name. Therefore the Labour Party is sometimes regarded also as Reshimat Emet (Emet List). Same goes with the leading Likud Party, sometimes also regarded as MAHAL list becouse of its letters: Mem-Het-Lamed. From the other hand, Shinui Party in not known as YESH (Yud-Shin) list but as "Shinui" and same goes about the MAFDAL which is not BET list. The extreme case is SHAS which is publicly known only by its letters (Shin-Sameh) and almost never regarded by its official name. After series of wrong doings by parties, especially in with raising and using of funds, the Knesset enacted an act in 1992 that specify rules about what is right and what is wrong. Since 1992, when registration become obligatory, 74 parties were registered. 2 already notify their disseverment so, today 72 parties are registered. However, many of those parties exist only on paper or stopped any activity, and just didn't bother to dissolve officially. Only 37 parties in 31 lists take part in 2006 elections. I have information about the flag of Israeli right-wing movement "Bead Artseinu". The flag have two sides - Temple and sign of "Jewish plus", which symbolizes doctrine of Hyperzionism.. The second image is the personal standard (banner) of the leader of the Movement. Information received from leader of Movement - Rabbi Abraham Shmulevich. Seems to be aimed at Russian-speakers, interestingly. Don't read anything too nefarious into the "Jewish plus." It's used by some Jews uncomfortable (for religious reasons) with making a cross, so the lower line is removed. Furthermore, it seems to be purely a design element here. Of course, there are some Jews who even avoid crossing their arms to keep from making a "cross" of sorts. If you're ever on an El Al plane, check the volume and channel controls on the audio/visual system- the plus sign is the "Jewish plus." I can't say I agree with this belief, but just wanted to point out that it's out there. That means that those Jews associate the cross exclusively with Christian religions and more important, they are ignorant that the origin of the plus sign "+" is not the cross but the Latin "et". See: <www.roma.unisa.edu.au>. The international Hyperzionist Movement "Bead Artseinu" ("For Motherland!") was founded in 2001 by a group of young Israeli politicians, intellectuals and journalists. 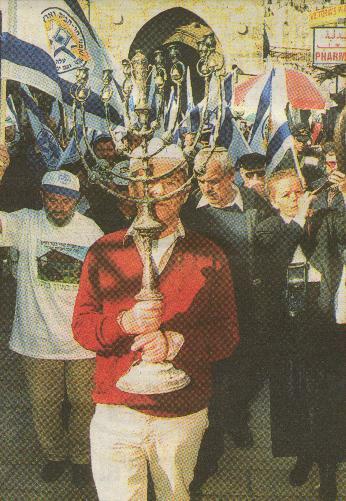 The Movement includes several hundred activists (primarily Russian-speaking repatriates, although there are representatives of different Jewish diasporas, as well as different nationalities). The number of those who support Bead Artseinu is numbering in the thousands. Today "Bead Artseinu" is the only movement on the Israeli social-political scene, which has a clearly defined strategic goal as well as a unique ideology. The official ideology of the movement is Hyperzionism. Hyperzionism is a thoroughly developed ideology, in development of which took part the best politologists of Israel and Russia. Hyperzionism is an ideology of the 3rd millenium, that has come to replace the obsolete ideology of political Zionism, which is intended to give a new impulse to the growth and development of Israel, and which fully corresponds to the realities of the coming post-industrial era. This is why the importance of Hyperzionism transcends the boundaries of Israel and is capable of resolving the most urgent questions faced by mankind as a whole. The intent of Hyperzionism is to support the development of a powerful and independent Israel as a country which would have leading roles in the global economy, science and culture, the creation of "the Israeli Empire" in minimal borders from the Nile to Euphrates, the rebuilding of the Jerusalem Temple, and returning of the glorious heroic image to the Jewish people, as described in Tanakh. The movement is active internationally. One of the main goals of the Movement's existence is to counteract Muslim fundamentalism, which presents a fundamental threat not only to Israel, but to the entire modern civilization. To enhance awareness of this threat and to unite the forces, capable of standing against it, "Bead Artseinu" employs its versatile international connections, first and foremost in Western Europe, Russia and CIS, in various Christian and Muslim circles. The movement has conducted a number of political actions, directed to defend the Jews of Diaspora, the Holy Land as well as in support of our political allies. Two films were made about "Bead Artseinu", which were screened on Israeli TV channels "Israel-Plus" (a film by Peter Majstrovoy "For God, King and Fatherland") and "NTV-World" (a film by Alexander Stupnikov "The New Jewish Revolutionaries"), also there was multiple news coverage on the TV networks of Israel, Russia and other countries. Also, a chapter is dedicated to the movement in a book "Against the Modern World" by professor Michael Sedgwick, published by the Oxford University (the book deals with modern Traditionalist political parties and movements). Altogether, the activities of "Bead Artseinu" receive regular coverage in Israeli and foreign press. Many members of the movement have gained recognition in various areas, for example, the leader of the Movement, Rabbi Abraham Shmulevich is a renowned publicist, a religious leader and historian, one of the leading specialists in geopolitics, his social studies articles and essays have appeared in various printed and electronic mass media of Israel, the United States, Russia, CIS and Western Europe; the Secretary of the movement, Alexander Rybalka, a renowned Israeli journalist, science-fiction writer, an author of five books, an expert on the Jewish mysticism (translated to Russian one of the most important books of Kabbalah "Sepher Yetzira" and compiled "An Encyclopedia of Jewish Demonology"); a member of the Political Council of the movement, one of the leading Israeli Russian-speaking journalist and publicists, an affiliate of the "Vesti" newspaper Leon Vershinin; the list goes on. The official mass medium of "Bead Artseinu" is website <www.zarodinu.org>, where materials are hosted in 5 different languages (Hebrew, Russian, English, German, French). Chapters of the movement exist in Russia, the United States, Great Britain, the West Indies and Germany with a planned chapter in Italy. The first need of the movement is to optimize the work of the website, establishment of its own printed edition, possibly in part for-profit, an establishment of its own Eshivah and Centers of Spiritual Development and the hosting of several scientific-practical conferences. I read this long message about this ephemeral movement which I never heard about. I would say that they exaggerate in the numbers and in its significance. The name of this movement is probably taken from the immortals words of Yosef Trumpeldur, a local hero who was killed in 1919 while defending his settlement in the upper Galilee (Tel-Hai) against Arab attack and while mortally wounded said: "it is good to die for the motherland". Gush Shalom (Peace Bloc, probably as opposed the right wing Gush Emunim), is a tiny radical left wing movement that support the Palestinian cause. The movement was founded in 1993. This tiny movement is usually demonstrate against the government and the IDF, and is denounced by the majority of the public. The flag of this movement is white and charged with the movement logo which is a combination of Israel and Palestine flags. Photo of the flag at zope.gush-shalom.org. More information and logo at hebrew wikipedia. 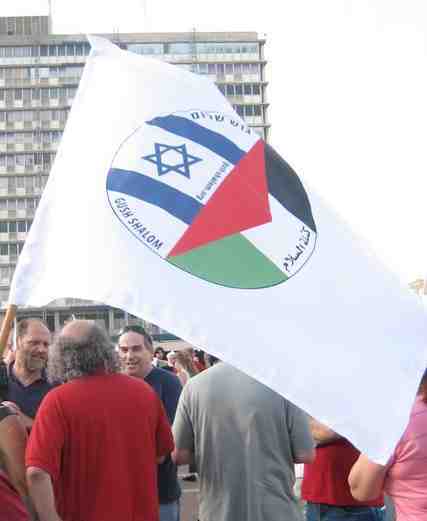 Photo of Israeli National Bolshevik Party flag can be seen at <www.online-translator.com>. Another photo of the flag can be seen here. Along with this flag, the party sometimes also uses the "generic" National Bolshevik flag with the hammer and sickle on a white disc, as shown here. However, it seems to be done quite rarely, mostly because the Nazi-looking design of the flag, which must be quite unpopular in Israel, but possibly also due to the fact that, while National Bolsheviks in other countries generally have an anti-Zionist and pro-Palestinian attitude, their Israeli counterparts are openly Zionist and frequently co-operate with other extreme Zionist groups. 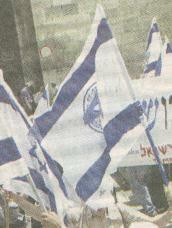 Yedi'ot Akhronot newspaper of 23rd May 2001 showed two pictures (first and second) of flags that were carried during the flag dance of Bnei Akiva a religious youth movement connected with the Mafdal or National Religious Party that took place the day before in front of Jerusalem wall. There were two kinds of flags in the dance, the national flag and another one based on the national flag with a logo replacing the magen David. The latter is not Bnei Akiva's flag but that of an extreme right-wing political movement named Tnu'at Ne'emanei Har-Habait, Temple Mount Trustees Movement. I located a better picture of the flag at their website. Their official name is the Temple Mount and Land of Israel Faithful Movement. "Two giant stones - 6.5 tons each - were transported yesterday morning...in a large parade around downtown Jerusalem, accompanied by dozens of cars draped with flags of Israel and the Temple. The stones are fit to be used as the cornerstones of the Temple, says Gershon Solomon of the Temple Mount Loyalists..."
It's a bit presumptuous for them to call the flag of their organization "the flag of the Temple." After all, there are a number of Temple-related organizations besides them. On the other hand, their logo is a simple picture of the Temple, so as long as there's no words, perhaps it's OK, if unimaginative. A report from Israel about a march around the walls of Jerusalem reports: "Among the sights...were...'white, blue and black flags depicting the rebuilt Temple' and strategically-placed flags indicating the names of the various gates for the marchers' edification." No further details as yet. I have just seen a magazine article with a picture of a Temple-related flag, but I'm not sure if it's related to any organization, or just represents the Temple as such. The flag is bright blue. In the center, surrounded by a white (cloudlike) shape that approximates their shape, is an image of the Temple facade (with outer courts) in red with gold details, and below it in gold, the Hebrew words "Yibaneh Hamikdash Bemiherah," "Build the Temple Soon." Few days ago, the Knesset voted in favour of PM Sharon's severing plan. For those who are not updated on Middle East politics, the plan includes evacuating of the Israeli settlements in Gaza Strip. win) but there could be also others. In the second photo, most demonstrators can be seen wearing orange t-shirts. Does the use of the color orange in both the flag and the clothing have any particular meaning? It is used, probably, because it don't represent any political party. I don't know of any other particular meaning. 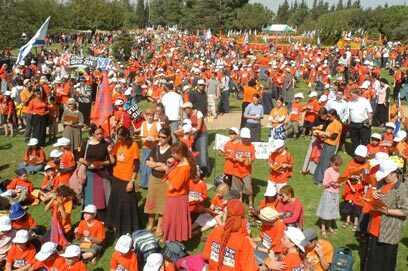 Orange has been chosen as a color symbolizing solidarity with the settlers in Gaza, worn as the color of caps, t-shirts, etc. 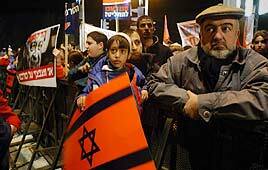 The settlers who are against PM Sharon plan to evacuate Gaza strip, choose the orange as their color. During a demonstration in Jerusalem yesterday, one could see many national flags with orange instead of white. One thing I've noticed looking at the crowd was that none of those were actual cloth flags, they all appear to have been printed on some sort of stiff material. I guess it make it easier to display in low wind condition. The flag of such movement was a six-pointed star (Magen David) in blue, two parallel lines also in blue (wider than the lines of the national flag) over an orange background with some words in Hebrew. I saw this flag in some windows, balconies and cars. The orange pro-settlers groups were distributing orange strips in crossways. They also sell this flags for 5 NIS. The Hebrew words could be: "Gush Katif" or "Yehuda VeShomeron". Supporters of the Disengagement Plan started to use blue strips but only few of them used it. I saw a photo by Baz Ratner/AP that made front page in the P?BLICO newspaper at August 14, 2005. It shows a flag which I also saw on TV waved by Gaza settlers, or at least militants against the Gaza retreat. Modelled after the Israeli national flag, it's orange in colour with two very narrow blue horizontal stripes above and below a Magden David, also blue (and clearly outlined in black in the original photo), and inscriptions in Hebrew above the upper stripe and below the lower stripe. Unfortunately, the photo only captures the central part of the flag and most of the writing becomes unreadable. This flag features the Hebrew and Arabic words for "Peace" (שלום or "Shalom" and سلام or "Salaam," respectively) over a seven-striped rainbow flag, seeming to mix the "PACE" rainbow peace flags with the seven stripes of the gay pride flags. That said, I'm not sure which category this flag would fall into, but wanted to post it here anyway. However, rainbow peace flags always have seven stripes, regardless of the inscription, while the gay pride flags usually have only six, sometimes eight, and very rarely, seven. In Israel, gay pride flags seem to always have only six stripes. Eight-striped version seems not to be used outside the USA at all, and the same with the seven-striped one (maybe a few exceptions) - they had both been originally abandoned after a short period of use, so it was the six-striped version that spread outside the USA. The recent reintroduction of eight- and seven-striped versions seems to be limited to the USA, where they have only been remembered outside the vexillologist circles. To cut it shorter, this belongs to Israeli political flags, not LGBT ones.